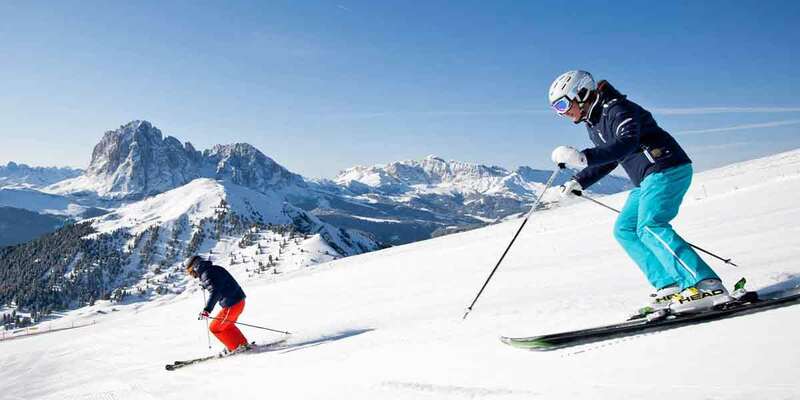 Ski holidays for individual travellers. Italy is blessed with a number of giant ski areas. Contact your Europe ski holiday experts at Estours Travel. Below is a selection of famous Italian ski areas together with suggested hotels. Fill in the quote form and send to Estours Travel to start planning your Italian ski holiday now. Choose to stay at Val Gardena (our favourite), Campitello di Fassa, Cortina d’ampezza, Corvara and more. For beautiful scenery and variety of terrain, none of them rival the central core of the Dolomites. The Dolomiti Superski lift pass covers 12 ski areas and a mighty 1220km of pistes linked by 450 lifts, plus the occasional bus ride. Included on this pass is the famous Sella Ronda – a circular network of lifts and pistes around the Gruppo del Sella, a majestic limestone massif, taking in several resorts. 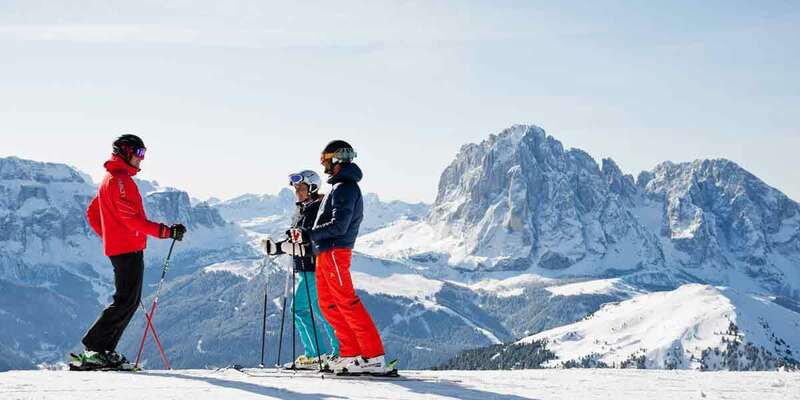 Val Gardena has been our Dolomite home base for Estours’ group ski holidays fro many years now. It has an excellent blend of easily accessible terrain, and is located on the Sella Ronda ski route. 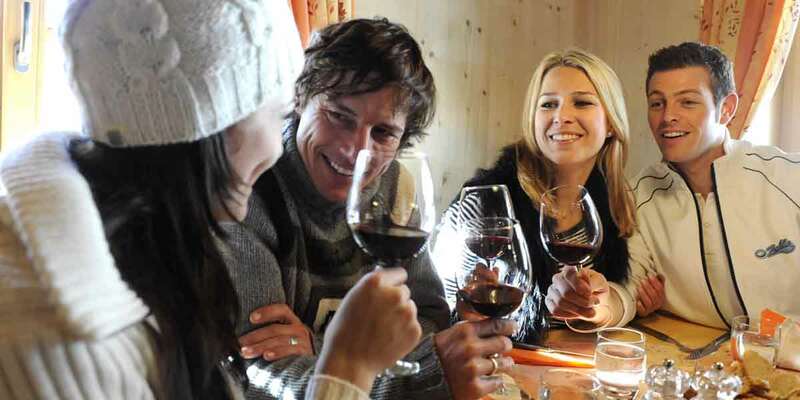 Here you will find a vibrant apres ski life as well as many restaurants, shops, ski hire and lots of accommodation choices. The Sassolungo World cup downhill course is accessible from the Ciampinoi lift out of Val Gardena and ends in the neighbouring village of San Christina. 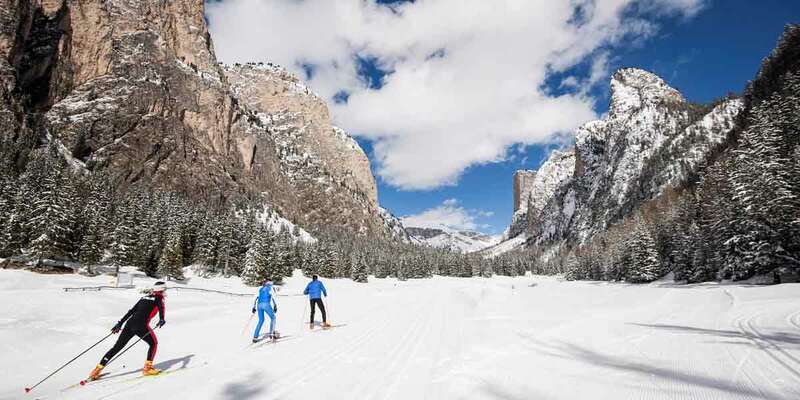 The lively and family-friendly village of Corvara, along with neighbouring San Cassiano which is smaller and quieter, is situated at the crossroads of two huge intermediate playgrounds. 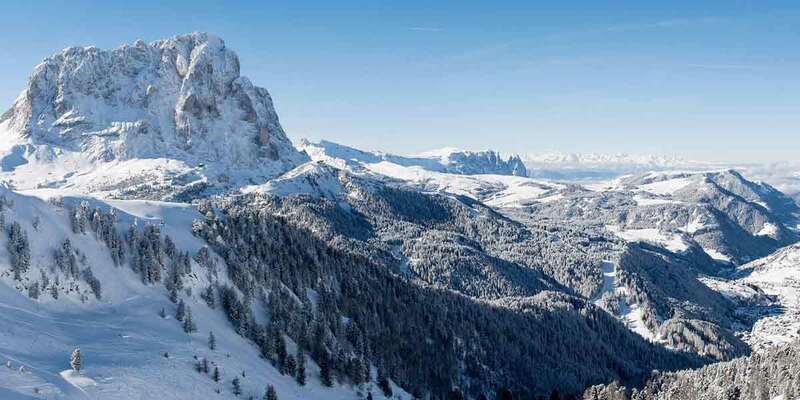 The local Alta Badia ski area also gives easy access to the Sella Ronda circuit, and both are rich in cruisy, confidence-boosting red runs that are usually well groomed. They’re also home to some delightful mountain restaurants. Cortina d’Ampezzo could be described as Italy’s chicest destination. It is an ancient mountain town in the Dolomites surrounded by soaring cathedrals of sandstone. The centre is dominated by a green and white bell tower and a glittering confection of grand 19th century mansions. Despite being variously occupied over the centuries by foreign invaders, including Austria and even the Americans in 1945, Cortina has stubbornly maintained a spiritual independence of its own. Campitello di Fassa is a tranquil Alpine village in the Fassa Valley in the heart of the Dolomites. It is well linked to 9 neighbouring ski areas and the ‘Dolomiti Superski’ lift pass covers them all. From here you are within striking distance of everything the Dolomites has to offer, such as varied and picturesque skiing – with plenty of terrain for everyone, dramatic Dolomite scenery and much much more. Campitello has maintained much of its traditional charm and ambience but still offers the facilities and luxuries of a modern ski resort: excellent hotels, pensiones and apartments, restaurants, cafes and shops. From any of these villages, you can venture each day as far afield as you dare before turning for home and ensuring you have time to catch the last lift. At sunset, the cliffs and crags of the Dolomites turn an extraordinarily vibrant shade of pink. The panorama is so enchanting that your eyes are perpetually drawn to the skyline, and sometimes it’s hard to concentrate on the snow at your feet. Probably the best located hotel in Val Gardena, this 4 star hotel will take your breath away. The Aaritz Hotel is situated in the centre of Selva, in front of the Ciampinoi cableway and close to the skischool and the main uphill facilities. The Hotel is elegantly furnished and offers you a fine and exclusive environment with comfortable sittingrooms, restaurant, bar, TV room, elevator and private parking place. They offer an exellent cuisine with a large range of regional and international specialities and English breakfast. The Hotel has rooms and suites with bath or shower and WC, safe, hair-dryer, SAT-TV, WIFI, telephone, bath-robe, slippers and balcony with panoramic view. The Aaritz Hotel is ideal for rest and relaxation with a sunny garden, an indoor swimming-pool, a sauna, solarium, fitness room and a massage room at your disposal. Hotel Alpi Val di Fassa is situated in Campitello di Fassa and is close to the area’s popular attractions. It is located a short stroll from Sella Ronda. The welcoming feeling you get when you enter Hotel Alpi, the warmth of the furnishings and, above all, the extraordinary beauty of the surrounding Dolomites instill a deep sense of serenity and comfort. Whether accompanied with family or friends, spending your ski holiday here will leave you with the most delightful memories! The hotel staff is also dedicated to making your stay as enjoyable and comfortable as possible and go to great lengths to take care of even the smallest details. Always polite and friendly, all the staff of the hotel portray a genuine warmth and unite together in order to make your stay unforgettable. The hotel has 44 spacious rooms offering all the necessities to ensure a comfortable stay. Bolzano Airport is a 65-minute drive from Hotel Alpi Val di Fassa. It also is an ideal location to discover nearby Canazei and Mazzin. In the center of Cortina d’Ampezzo, queen of the Dolomites, the 4-Star Hotel Cortina offers hospitality and professionalism from a management that has a reputation of providing the best amenities since 1870. This hotel, with the recent addition of a restaurant, is distinguished by attention to details and the high-tech services made available to their guests, in an ambiance of rare elegance, overlooking Corso Italia, the prestigious pedestrian zone of Cortina. Located in front of Cortina’s bell tower it offers a traditional restaurant with terrace. All rooms at the Cortina Hotel feature wood floors, a TV and free Wi-Fi. A wellness centre with hot tub and Turkish bath is available at an extra cost. Hotel Cortina has a snack bar on Corso Italia as well as a restaurant where guests can enjoy a large buffet breakfast. The half-board option includes a wide selection of fruits, cheeses and desserts at dinner. The property is 300 m from the Faloria cable car. The ski bus stops 50 m away from the hotel. Courmayeur lies less than two hours from both Turin and Geneva. This charming, traditional mountaineering village is situated in the lee of Mont Blanc at the Italian end of the Mont Blanc tunnel, with Chamonix in France at the other end. Explore the pretty pedestrianised Via Roma, with its smart designer boutiques and comfortable cocktail bars. Even though this area is very popular, you may be forgiven for thinking that the pistes will be crowded in the morning, but, fortunately, only a small proportion of visitors hit the slopes. They come for the party rather than the piste. Restaurants both in town and up on the mountain are of a particularly high standard, and Courmayeur is one of the spiritual homes of the long lunch. Grand Hotel Courmayeur Mont Blanc offers modern rooms with panoramic mountain views in Courmayeur. It features an indoor pool, a garden, and a wellness centre. The soundproofed rooms are furnished in modern Alpine style and come with free WiFi, cable TV, and a minibar. The en suite bathroom includes a hairdryer and complimentary toiletries. The Grand Hotel Courmayeur’s restaurant serves traditional Italian and regional cuisine. A buffet breakfast can be enjoyed daily. A sauna and a Turkish bath at the Grand Hotel’s spa invite to relax. Massages can be booked on request, and a fitness centre is also available. Ski equipment can be rented on site. A ski bus takes you from the hotel to the Dolonne and Mont Blanc cable cars, both 1.5 km away. Hotel Dolonne is a 16th-century stone house in the ancient village of Dolonne, 150 m from the Dolonne ski lifts. It is a 3-star hotel situated in central Courmayeur, a short drive from Pre-Saint-Didier. Cable car Val Veny is within a 10-minute drive away, and the property offers free parking. Amenities at the hotel include a concierge, ski lockers and luggage storage. It also features a safe and a library. Wi-Fi access is also available. The rooms at the Hotel Dolonne offer cable / satellite channels, a hair dryer and complimentary toiletries. Each offers facilities such as a telephone and a TV. Extremely spacious rooms specifically designed to accommodate families are available on request. The Hotel Dolonne has an on-site restaurant, convenient for those wishing to dine in. Guests can enjoy a drink and relax in the hotel’s bar. Packed lunches can be prepared on request for guests wanting to sightsee during the day. The Hotel Dolonne is a 10 minute walk from Cable Car Dolonne, while Funivia Courmayeur can be reached on foot in less than 20 minutes. Aiguille Blanche de Peuterey and Mont Blanc are less than a 20-minute drive from the hotel. 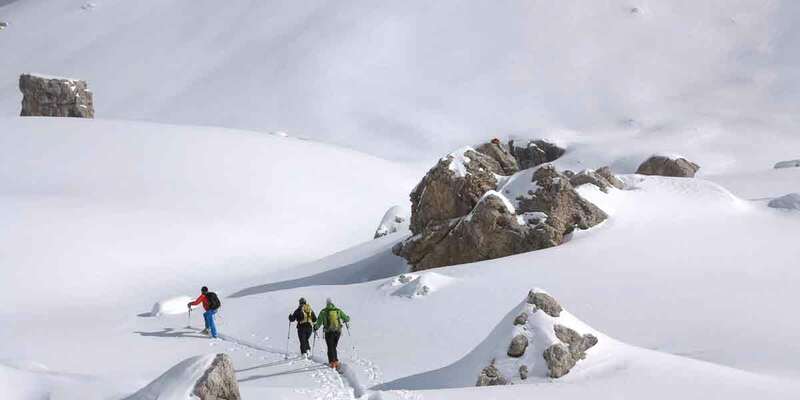 This is a high-altitude resort with fabulous long runs, and even in the driest Italian winter top-to-bottom snow conditions are virtually guaranteed from December to the end of April. Plus, there’s good grooming and snowmaking on key runs. Cervinia has 160km of pistes covered on the local lift pass and is also linked by lift to Zermatt in Switzerland. There’s a total of 360km covered on the more expensive International pass. Cervinia slopes offer a wonderful playground, dictated by the easy gradient of its seemingly never-ending runs. These allow beginners and wobbly intermediates to gain enormous confidence in an extensive high-mountain area. The 8km Ventina red run, with breathtaking views of 4,000m peaks, descends a mighty 1,833m from the top of Plateau Rosa (3,480m) all the way down to the resort, and if completed without a stop is guaranteed to turn even the strongest legs to spaghetti. Set in the town of Breuil-Cervinia, the Europa Hotel is in one of the most popular ski resorts of the Alps and Aosta Valley. The hotel benefits from a wonderful location just a stone’s throw from the centre of town and very close to the ski lifts. Indeed, guests at the hotel have direct access to the ski slopes at Campetto Cretaz and can savour a spectacular view of the Matterhorn. Alongside the modern, refurbished rooms (including 4 new suites), the recently renovated sport-friendly hotel also offers rooms with a more traditional design. Depending on the room, guests can enjoy stunning views of the Matterhorn, the Grandes Murailles mountain range or the town of Breuil-Cervinia, surrounded by the mountains. Many of the rooms feature a balcony. The Breuil – Plan Maison cable car is 800 m away. The rooms all come with a satellite TV, minibar and either parquet or carpeted floors, and some of them have a balcony. WiFi is free. A buffet breakfast is served each morning and the restaurant specialises in dishes from the Aosta Valley. You have free access to the hotel’s swimming pool. The hotel also features a small fitness centre and wellness facilities including a Turkish bath, hot tub and a massage room. Offering ski-to-door access from the Campetto Cretas slopes, the Punta Maquignaz is an Alpine hotel with a sauna and Turkish bath. Its wood-panelled rooms have satellite TV, and Wi-Fi is free in the lobby. The hotel was built in the 50s, and was completely renovated in 1998 and 2004, trying to keep the atmosphere of the mountains as well as the Family’s spirit, whose ancestors were some of the most successful alpine guides of Valtournenche. Rooms at Hotel Punta Maquignaz feature views of the Alps. Each comes with carpeted floors and a hairdryer in the private bathroom, while some rooms include a balcony. A sweet and savoury breakfast buffet is provided daily. Open in the winter and spring, the restaurant specialises in local cuisine. The hotel also has an on-site pub. After a day skiing, guests can use the free equipment storage and relax on the sun terrace. Ski hire and ski passes can be organised at reception. Hotel Punta Maquignaz has a shuttle service to/from the ski slopes upon request. The A5 Autostrada della Valle d’Aosta motorway is 29 km from the hotel. Aosta, the regional capital, is a 1-hour drive away.